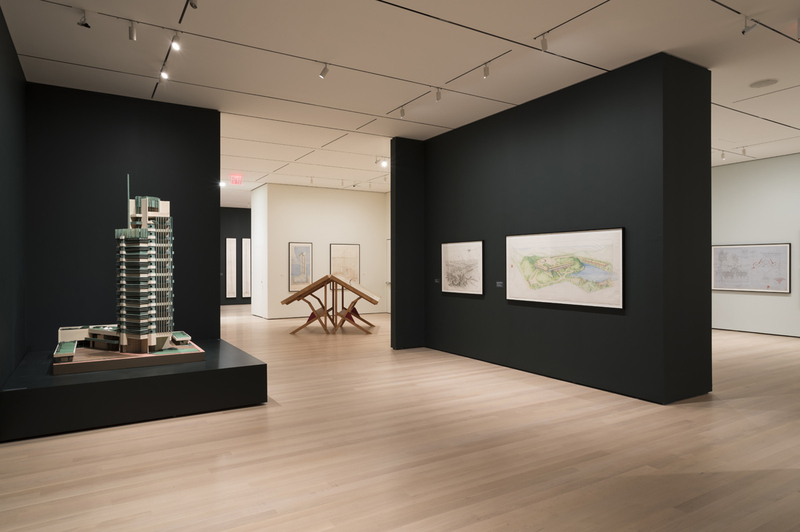 Coinciding with Wright’s 150th birthday, “The exhibition seeks to open up Wright’s work to critical inquiry and debate, and to introduce experts and general audiences alike to new angles and interpretations of this extraordinary architect,” MoMA says. That has largely been accomplished through the structure of the exhibition. Barry Bergdoll, curator, Department of Architecture and Design, MoMA and the Meyer Schapiro Professor of Art History and Archaeology, Columbia University, brought in scholars in a range of ages and Wright-related experience levels to help mine the massive archives that MoMA and Columbia University’s Avery Architectural & Fine Arts Library jointly acquired in 2012 from the Frank Lloyd Wright Foundation in Arizona and Wisconsin. 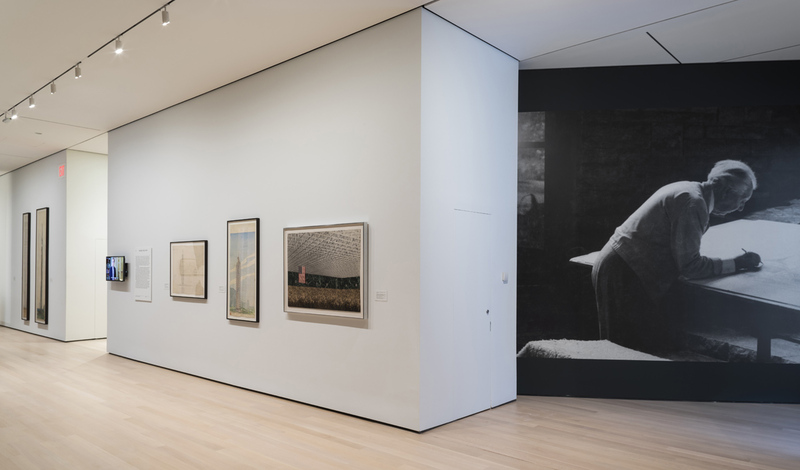 Each curated one of 12 sections that together present Wright’s work as an anthology. 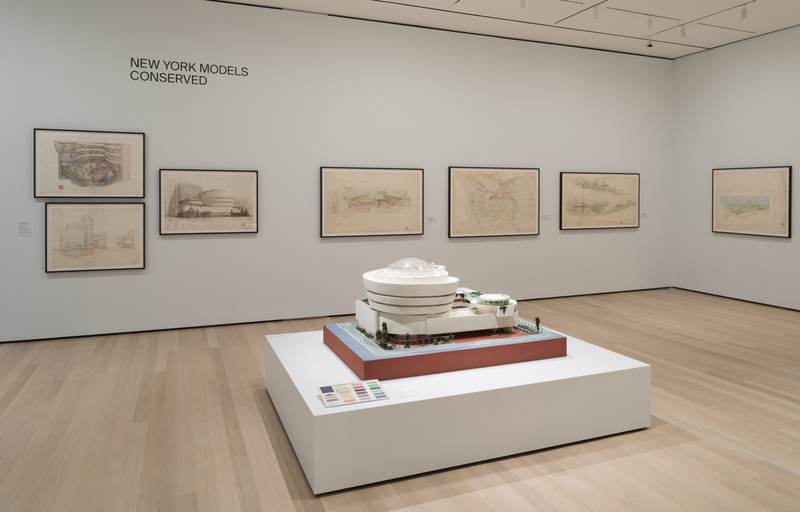 The wide-ranging retrospective includes early depictions of the Guggenheim, with swirling concrete proposed in both orange and pink instead of its iconic bright white; an eight-foot-tall drawing (from which a 22-foot photo reproduction was subsequently made for a press conference) of Mile-High, a proposed skyscraper in Chicago; a feisty televised interview with ABC journalist Mike Wallace; a model of St. Mark’s Tower, which would have been New York City’s first glass skyscraper and which needed painstaking restoration before its inclusion in the exhibition; and of course, a drawing of Fallingwater, sketched out in multicolored pencil. 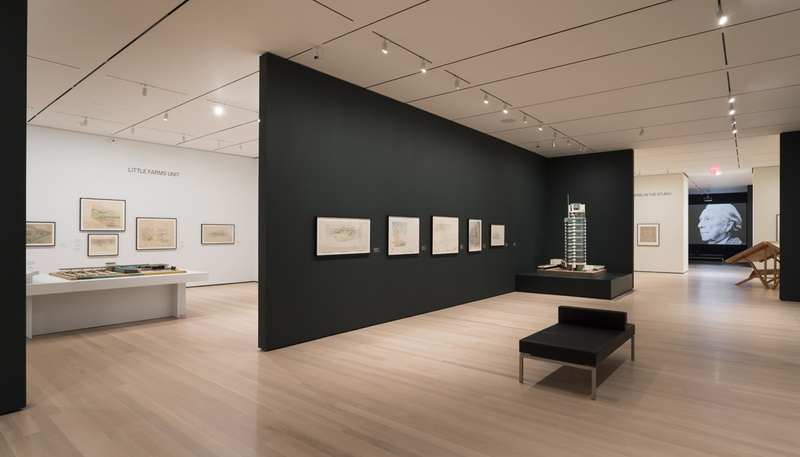 So vast is the Wright archive —some 55,000 drawings, 125,000 photographs and 300,000 pieces of personal and professional correspondence — that even after a dozen or so previous exhibitions at MoMA, Bergdoll says there’s still more to see and more for Wright to say, even almost 60 years after his death. 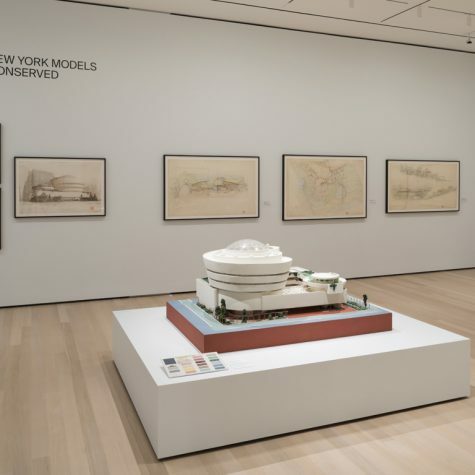 “I was very surprised at how many fascinating aspects we were unable to address, which convinced me that there are many more intriguing and eye-opening shows to do on Wright in the future, now that the archive is in New York,” he says. Bergdoll gave us a behind-the-scenes look at what it took to design and execute the exhibition, and into the psyche of Wright himself. 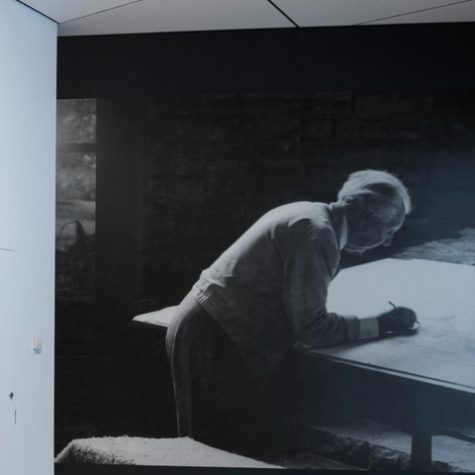 Coldwell Banker Global Luxury During your conversation with MoMA Director Glenn Lowry, it was said that “Frank Lloyd Wright at 150: Unpacking the Archive” is intended to introduce audiences to new angles and interpretations of the architect. How exactly would you say the exhibition accomplishes this? Barry Bergdoll Many of the drawings and models chosen are of little-known projects that shed new light on lesser-known aspects of Wright’s career: his designs with Walter Burley Griffin for the garden of the famous Martin House, with a detailed listing of the plants to achieve an architectonic garden effect; his 1928 project for an improved school for African American children in the South through the almost-forgotten Rosenwald Fund school program; his project for a “Little Farms Unit” and his involvement in debates over farming and food distribution in the heart of the Depression and Dust Bowl; his designs for taming the skyscraper in 1926; and his design three decades later for the Mile-High skyscraper. These designs come to life through the films made of the “unpackers” or guest curators that capture them at work in the archive trying to understand and contextualize these lesser-known projects. 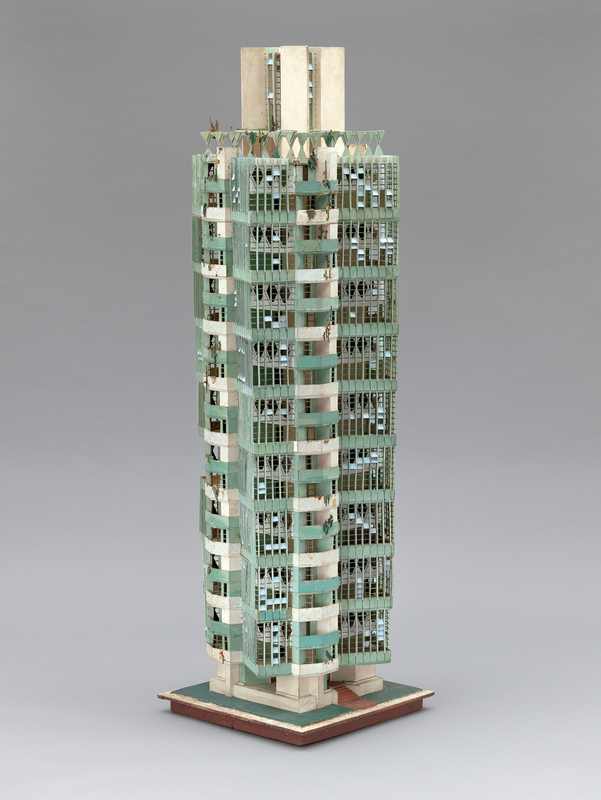 Coldwell Banker Global Luxury What will Frank Lloyd Wright experts learn about the architect from this exhibition? Barry Bergdoll To begin with, they will learn about the aforementioned projects, but they will also learn about the role of some figures and clients who have, until now, not loomed large in the Frank Lloyd Wright story, like the Little Farms Unit, or J. J. Polivka, the Czech émigré engineer with whom Wright collaborated on a project for a bridge over the San Francisco Bay. 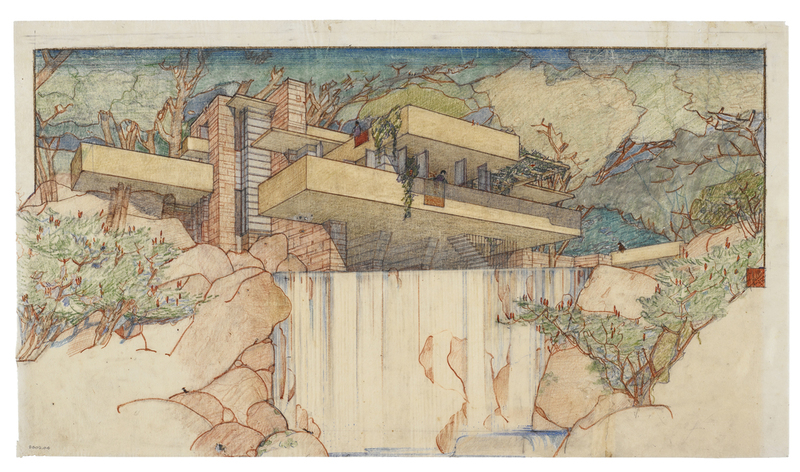 Coldwell Banker Global Luxury What will individuals whose Frank Lloyd Wright vocabulary begins and ends with Fallingwater get out of this exhibition? 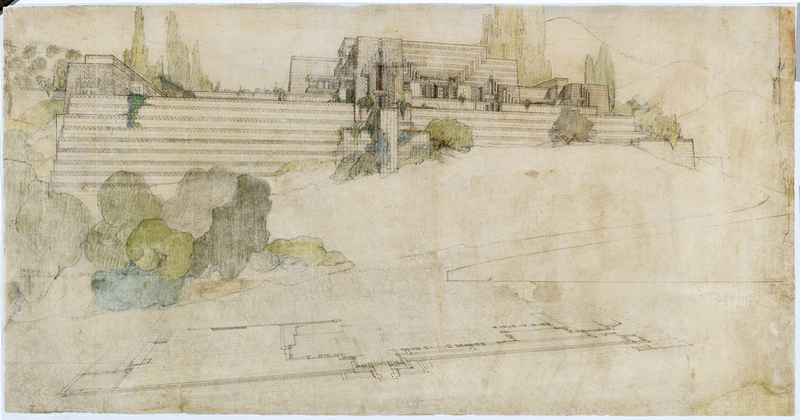 Barry Bergdoll They will understand that daring and singular house design is the lynchpin between Wright’s earlier and later career, but also that Wright was an architect who continued to experiment until his 90th year! Coldwell Banker Global Luxury How did the idea for this particular exhibition come about? Barry Bergdoll With the transfer of the archive from the Frank Lloyd Wright Foundation to Columbia and MoMA, we had committed to present a major exhibition in the fifth year after the transfer, which happened to coincide with what would have been Wright’s 150th birthday. After toying with several themes for an exhibition that I would curate alone, I realized that the exhibition was to be a celebration of the archive itself and thus should convey to the general public what an archive is, how scholars work in archives, how one asks questions of materials in an archive, and how insights are gained by archival inquiry. 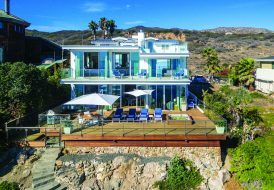 Coldwell Banker Global Luxury Why would you say there is such a continued fascination with the works of Frank Lloyd Wright? Barry Bergdoll Because Wright redefined the American home and people are always interested in the architecture of the everyday domestic environment; because there are simply so many buildings by Wright that can be visited, including, of course, the spectacular Guggenheim and Fallingwater; because his interest in nature has a wide appeal; and because Wright’s colorful life made him an object of continual media attention for decades during his lifetime. Coldwell Banker Global Luxury The exhibition has been described as “like a research library.” Can you speak to the strategy behind that? 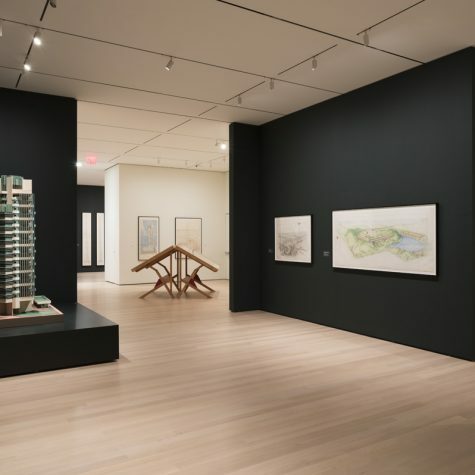 Barry Bergdoll The idea is to show how materials produced by architects can be studied and interpreted, since one cannot bring the actual architecture into the space of the gallery. Coldwell Banker Global Luxury What was behind the choice of inviting younger scholars to participate in the exhibition? Barry Bergdoll It was important to show that new voices can have something to say about Wright, and that the questions that younger scholars are asking about modernity, the environment, building materials, nature, and race and ethnicity could also shed new light even on such a well-known figure. We wanted also wanted the show to announce the new accessibility of the archive. 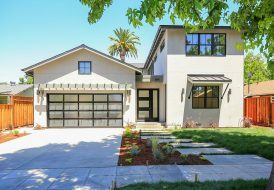 Coldwell Banker Global Luxury Again, from your conversation with Lowry, you described the “Starchitect” phenomenon as unfortunate, because it creates an idea that architecture “is something of celebrity culture” and is inaccessible. What do you think Wright would think of the term? Barry Bergdoll Well, I think in some ways that Wright was the forerunner of today’s Starchitect, a brilliant manipulator of media to advance his own fame and celebrity. Witness his appearances on television. 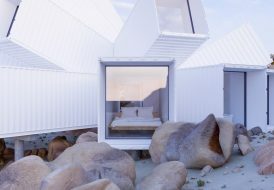 But on the other hand, Wright wanted to design systems of building that could make inexpensive houses of higher-quality design available to a very broad audience, even imagining systems of construction that could be more or less do-it-yourself. Coldwell Banker Global Luxury What were some of the most unique challenges in creating this exhibit, and how were they overcome? Barry Bergdoll Working with more than a dozen guest curators, many of whom have never worked in an exhibition as a format for their research and ideas, was probably the biggest challenge. This required a great deal of hands-on working with the scholars, not on their research itinerary but on the selection of materials that would be the most compelling on display.